See how the Katalon Studio automated testing framework can be used to prevent conflicts when using Git for source control. 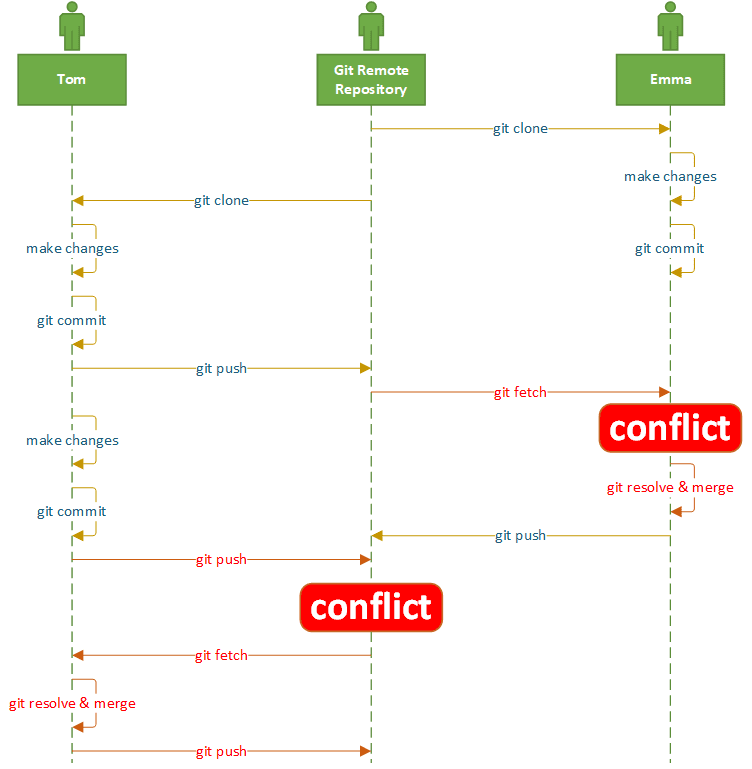 Why Do We Have Git Conflicts? In a source control system like Git, conflicts may occur when two or more people make changes to the same file concurrently. The conflicts may appear at a member’s local repository or Git remote repository. In order to avoid conflicts, the team must collaborate following several Git practices. For example, before pushing new source code to the Git remote repository, one must remember to fetch the latest version from Git remote repository, resolve any conflicts and merge the code with the local version. The chart below demonstrates how conflicts may occur when Tom and Emma are working on the same project. The conflicts occur when Tom and Emma try to push new code to the Git remote repository without updating the changes from each other. Let’s consider the following situation: Tom and Emma are working on the same test case in a test project. Emma added a new comment (“EMMA ADDED THIS COMMENT”), then committed and pushed the change to the Git remote repository. At almost the same time, Tom also added a new comment (“TOM ADDED THIS COMMENT”), then committed and tried to push to the Git remote repository. 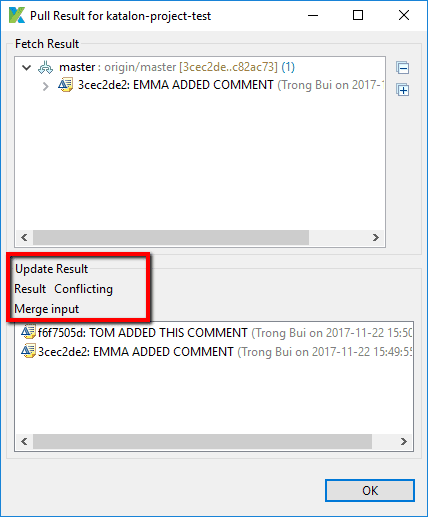 Unfortunately, since Emma had pushed the code before Tom, the version of the code in Git was different from the version of the code in Tom’s local repository and therefore, Git rejected Tom’s “push” action. What should Tom do to push his change to the Git remote control? First, Tom has to “pull” the code from the Git remote repository to his local machine. Recall that the comments were added by Tom and Emma, and the “conflict” is now on Tom’s Katalon Studio project. Everything within “<<<<<<< HEAD” and “=======” is the change from Tom. And, everything within “=======” and “>>>>>>> branch ‘master’…” comes from Emma, which is currently in the Git remote repository. After resolving the conflict, Tom is now able to commit and push the change to the Git remote repository. Commit often: do not wait until a huge amount of scripts created to commit and push to the Git remote repository. The smaller set of the scripts is pushed, the easier you resolve the conflict. Pull changes from the Git remote repository before working on new scripts and before committing. Each member works on each feature at a time. 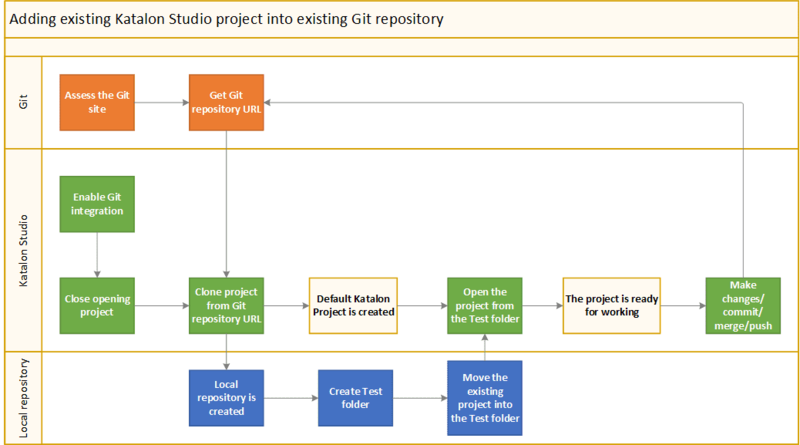 Git is a very powerful system for source version control, so if you have more than one member on your Katalon Studio project, you may consider using Git as a remote repository for your testing project. 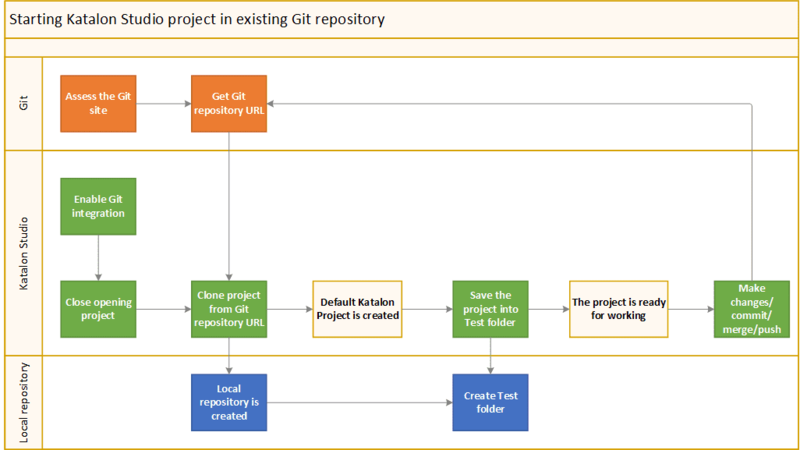 The content below provides several typical workflows for working with Git using Katalon Studio. Each workflow is presented via a diagram with each activity being taken from either Katalon Studio, Git, or Local Repository. Below are some good practices in using Katalon Studio integration with Git. Below is a recommended workflow for starting a new Katalon Studio project and integrating with Git. The main activities in this workflow include Katalon Studio Registration, enabling Git integration, creating a Git repository, and cloning the project to Katalon Studio. 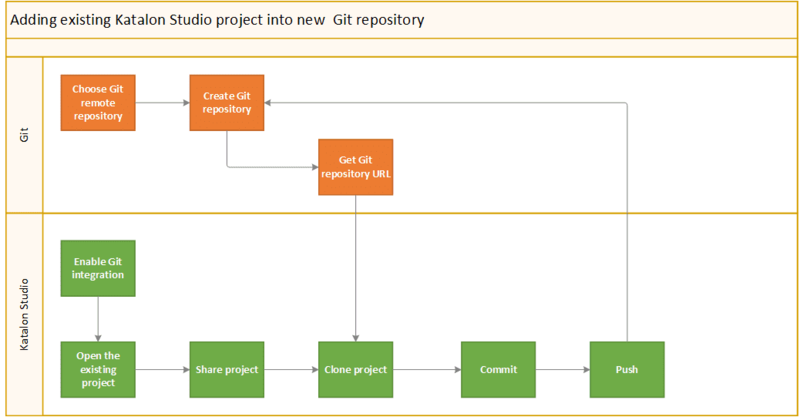 In case you have an existing Katalon Studio project and you want to add it to a Git repository and share it with team members, you can apply the following workflow. This workflow involves Commit and Push changes to Git. Very often, we have a Git repository from the development team for storing production code. The QA/tester team is required to save automation test scripts into this repository under a "test" folder. The situation is a bit more complicated if your automation team already works on a Katalon project for a while and tries to add it to an existing Git repository of the development team. In this case, you can apply the following workflow. In this workflow, you have to move the existing Katalon automation project into the test folder of the development’s local repository. You then open the Katalon project from Katalon Studio. For further instructions and help, please refer to the Katalon Studio Tutorials and Katalon Forum.